To delete records by searching in the specified field, click Edit | Delete Records. Delete records dialog box opens. You may delete/recall a single record. To delete the record in dbf file, select it and select menu command Edit | Delete/Recall Record menu, or click the corresponding icon on the toolbar. The deleted record will be marked with the red sign. To restore the deleted record, select it and repeat the same action. To permanently remove all deleted records, click Edit | Pack. To delete duplicates, click Tools | Delete duplicates. To delete empty records, click Tools | Delete empty records. To recall deleted records, click Edit | Recall records. 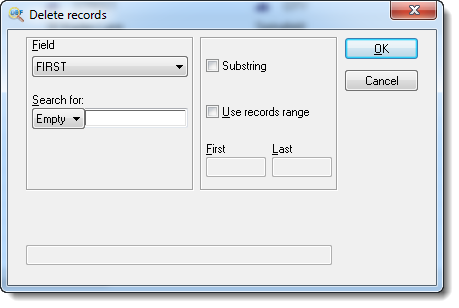 To delete all records starting from a selected record, select the record that you want to be the last one, and click Edit | Truncate. Confirm your choice. All records below the selected record will be permanently removed. To clear the entire file, click Edit | Zap. All records will be removed.